Graduating from my MA in Contemporary Performance Practices in 2015, I floated from job to job before coming across the Artsadmin Traineeship. Before I entered further education I had little experience of contemporary art and during my studies I had only really scratched the surface of experimental performance and was impatient to learn more. However, not being London-based and not having the money to see things regularly, I found it difficult to keep up with the scene. The Traineeship was my chance to be at the heart of contemporary performance and live art, and to be a part of an organisation whose work I respected and admired. The beginning of the year brought me back to my hometown of Birmingham, coordinating Steve Lambert’s incredible conversation starter, Capitalism Works For Me! (True/False) at Fierce Festival and I am ending my year at the Barbican as Assistant Producer on METIS’ debut of WE KNOW NOT WHAT WE MAY BE. Each project I have worked on has taught me new skills and broadened my understanding of what contemporary performance can be. One of the highlights of my year has to be spending the day creating live art with Year 3 at Canon Barnett Primary School. 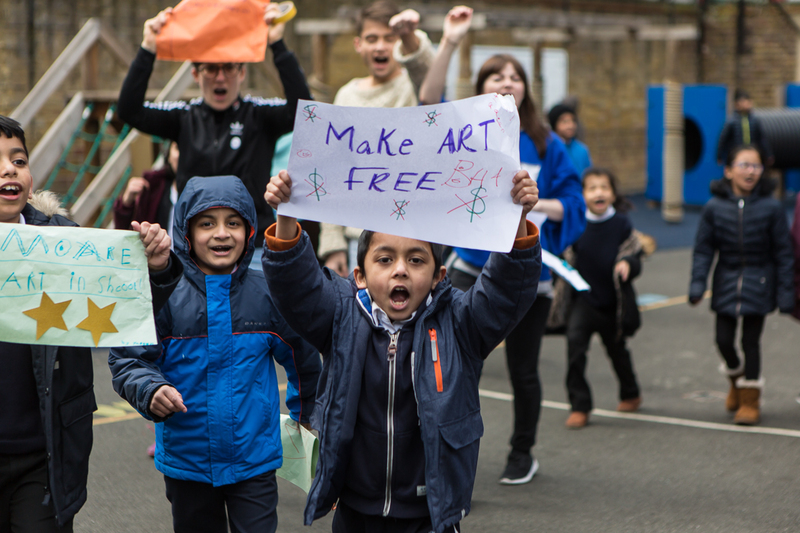 Watching the children initiate a protest in the playground chanting, “Make art free!” as they recruited others to join them was a really special moment. Ask if you don’t understand. As awkward as it can feel to ask, sitting through a conversation and coming out the other end not having a clue what’s been said is worse! In my experience, people are always happy to help and don’t mind the questions. Rest is important. Producing can be intense and you'll work lots of long hours supporting other people. Therefore, it’s okay to have a day off from artsy stuff and stay in and watch Love Island. Download Citymapper. (Maybe one for the non-Londoners) This app definitely helped me get from A to B on time and in one piece on numerous occasions when I was on a tight schedule. If you're interested in taking a first step into a career in contemporary arts, read more about Artsadmin's Traineeship, which is now open for applications. Deadline: Thursday 26 July.